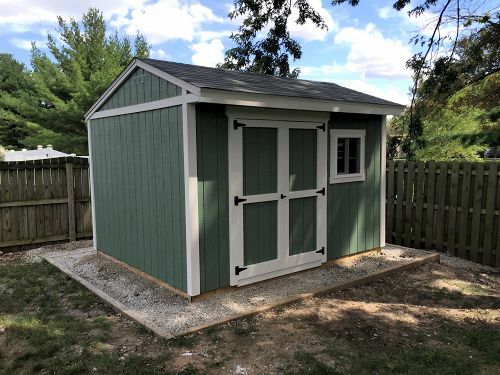 Nice Job Dan on Your 12x10 Saltbox Shed! 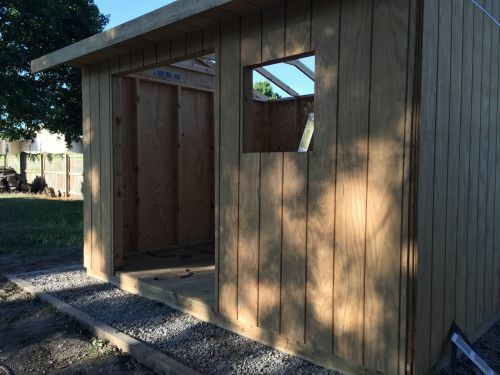 Here's Dan's 12x10 saltbox shed he built using my 12x10 saltbox shed plans. 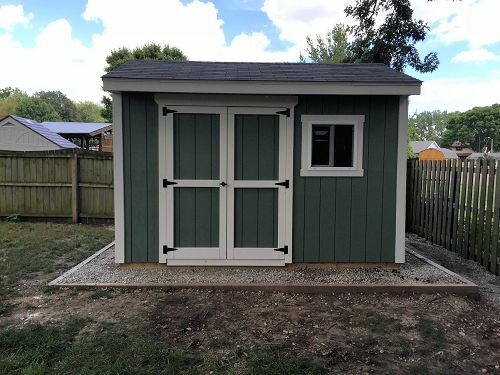 This shed has lots of character and Dan did a beautiful job building it. The color scheme looks great! This is one nice looking shed! 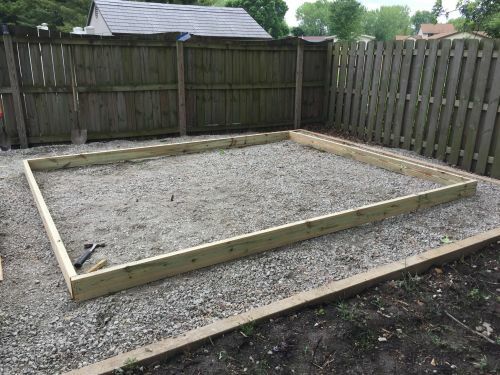 Dan has made a compacted gravel base which is perfect for setting your shed on. This looks to be about 4" of compacted gravel. The floor framing is being done with treated 2x6 lumber. 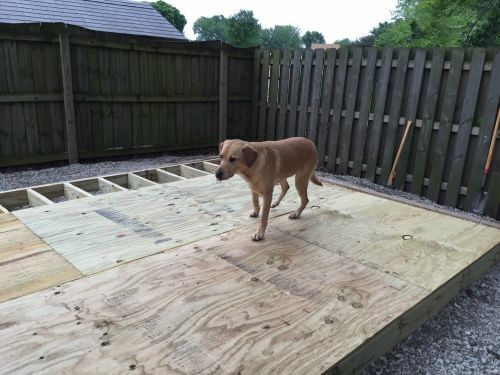 Looks like the family dog is checking out the progress of this neat 12x10 saltbox shed. Dan is also using treated plywood panels to sheet the floor with. Notice how the panels are staggered to help strengthen the floor up. 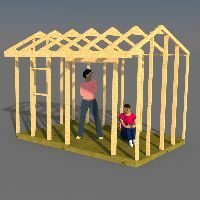 The walls are framed with regular lumber, however the bottom plate shown in the plans is treated. These are options you can go with in these plans. The flooring and bottom plate don't have to be treated, but recommended. Setting the trusses into place. 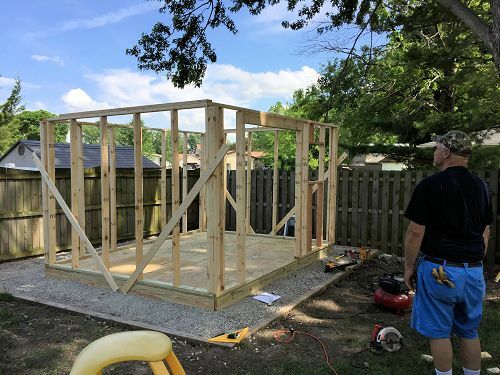 This shed won't have very much storage space in the loft area, but Dan has picked these 12x10 saltbox shed plans because this wasn't necessarily a needed option down the road. 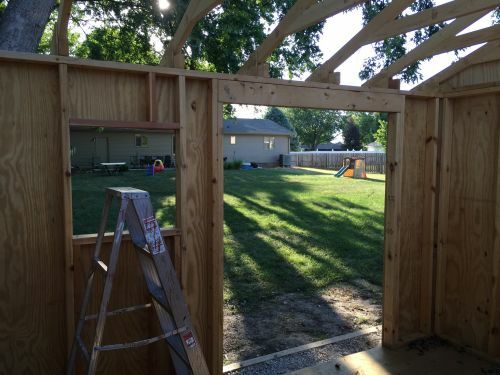 Pre-built shed trusses spaced 24" on center. The walls are also spaced 24" on center, so you can see where Dan placed his window. 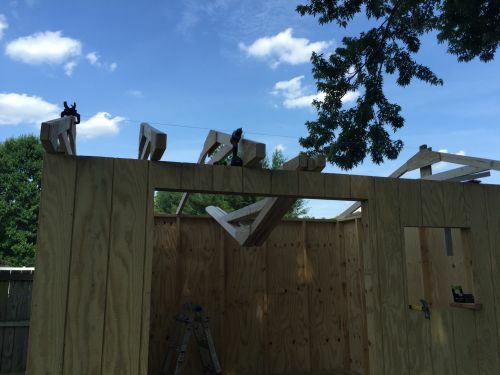 Right in between 2 wall studs, and the trusses above are resting on these wall studs, so no need for a window header. 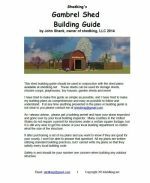 The plans for this shed show LP smartside siding panels. 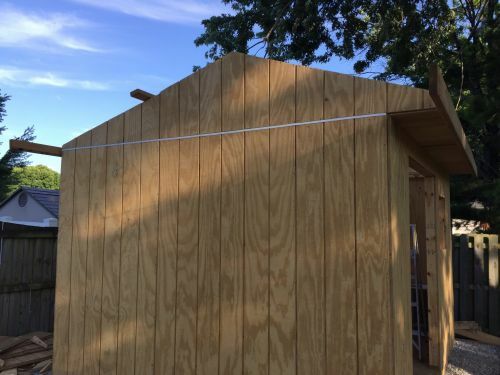 Dan is using t1-111 siding sheets for his shed. This is a good choice for shed siding, however it needs to be primed and painted, and will probably need maintenance every few years or so. You can see here on the side that Dan has placed a flashing between siding panels. 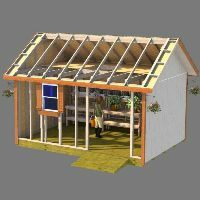 This is known as a 'z' flashing, and helps prevent water penetration to the inside of the shed. It also protects the horizontal edged of the siding panels. A nice view of the front showing the soffit framing. 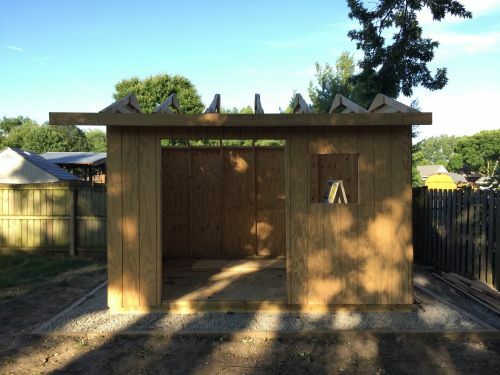 Dan, you did a great job building this nice 12x10 saltbox shed! I hope it gives you years of satisfaction. You can really be proud of this accomplishment! 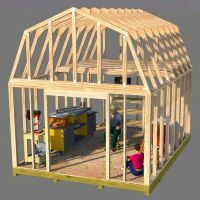 Here's the 12x10 saltbox shed plans Dan used to build his neat shed.